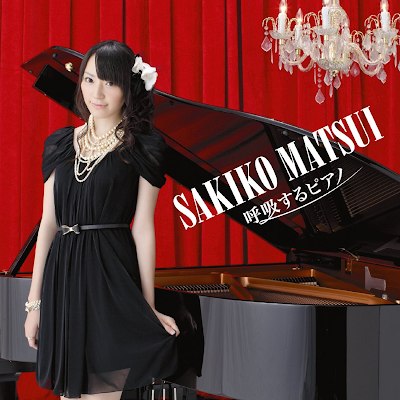 So about a week ago I've started to listen Matsui Sakiko's piano album. I heard this album for awhile ago and of course I'm excited. So when I've got this album I was like….YATTAAAAAA!!!! Playing "Time Goes By" form Every Little Thing in Teppen. She won the tournament btw. Now let's continue with the album. Kokyuu Suru Piano begins with this song. A theme song from their Cup Noodle advertisement. A classical-tune with a laid-back melody. This 3 minutes and 22 second track gives you impression about what's going ahead. First Master Matsui (according to what Jurina said) rendition of AKB's single. This track begins with such a different intro, a somewhat Rachmaninoff-style. Then it follows with usual Aitakatta intro then she slowing down the pace and then go faster and harder, slower it down again, go faster again, and so on. Hearing this piece, you can feel she's really enjoying this work. THIS what I called a total remake. In this track, Sakiko goes all the way to totally modificated the song. The intro sounds like something that comes from Latin movie followed by the combination of Sakiko hard-hitting the key and jazz-beat bass line, producing a track that could be playing in some cafe in town. In this track, Sakiko decides to play the supporting part while sometimes shows her skill (like in 1:40 - 1:42 & 2:42 - 2:50). One of the highlight of the album. Things are slowing down this time. Sakiko back to her root, you know, classical music. Utau Ketsueki is a ballad piece and you could feel, err, I think, Chopin's influences here. 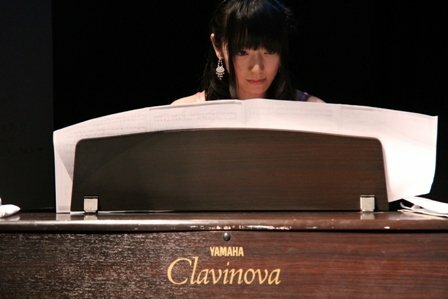 Again, Sakiko shows you some skill and make you imagine her finger jumping around piano. On a side note, I feel she puts emotion here and as a result this piece sounds very….sad. A lovely rendition of my favorite summer song. Here Sakiko doesn't totally change the tune. She just put a little twist here and there, like in "Kimi ga suki da kotoba ni dekinai yo" part. I think it's good since EbiKachu is a nice song. The theme song for Google+ x AKB48 Project and the one that made in PV. A total opposite from EbiKachu tune, this sounds a kind of dark. Here Sakiko often goes around minor key and followed by simple major key. That combined with timpani, tambourine, maracas, and haunting background vocal, producing a mysterious and overall dark tune. "In your position, set!". Honestly, Beginner is such a surprise. I mean the track itself is a hard-beat electropop song and here, Sakiko tries to play it in piano. But since she's the Master Matsui, she's doing a great job. Just like EbiKachu, this mega-hit single just receive little twist here and there. Notably said the second verse when she suddenly change the key. Another nice rendition that shows she perfectly transferred electropop song to classical piano piece. The rendition continues with a song about hairstyle. Talking about PonyShu, many of AKB fans will remember Yoyogi Concert when she's playing the intro. This time, she did it again. Starting from the usual beautiful intro she invites us to follow her rendition. In PonyShu, Sakiko doesn't change the tune but she's doing many, many improvisation. Just listen to the bridge, she totally changes it. The improvisation continues to the end where she goes, like "hitting ALL the keys in piano!!!" with having her trademark grin while doing this move. But hey, I don't mind because it's just sooooooo good. And mind you, this is her album. She can do whatever she wants. Another total remake (she loves to drastically change the Sousenkyo single, eh?). This time Sakiko changes a super-ultra-energetic song to Reggae. Eh? Yup, you hear me right. Reggae. So the usual Hebi Rotesyooon change to laid-back tune with soothing trumpet and reggae-styled bass line. Again, in this song Sakiko plays the supporting role. Just providing background music while letting the trumpet do the work. Great piece of work and I'd like to see she performs it. While the other member being rastafarian. Sounds nice, eh? The last AKB's rendition. This time is the Sakura song from 2011. I respect her decision to not screw the song by doing a drastic change. Sakura no Ki Ni Narou already has a nice arrangement, so why you have to screw it up. So what she's doing is make it a little prettier by adding a touch of orchestra. But that little touch alone enough to make this already sad song becomes much, much sadder. I think Sakiko puts a lot emotion too while playing it. Makes it such a tear-jerker ballad. To wrap things up, Sakiko decides to insert a pure classical piece. This time she goes with Piano Sonata no.18 K.576 by Wolfgang Amadeus Mozart. For me, I would glad if she could show some skill by playing Rachmaninoff or Debussy or Chopin in C-Minor just like what she did in Yoyogi Concert. But, again, it's her OWN album. Beside, this is the background song for Glico's Aisu no Mi "Murderer" CM. So….there your answer. The track itself is good and Sakiko really shows off her skill. All hail Master Matsui! Just what I stated before, Sakiko is good at piano and this album shows you. Of course you can't compare her to the kind like Maksim Mrvica or Yanni but you can't call her bad, beginner, or novice. This is her world and she's doing it since a long time ago. Hearing Kokyuu Suru Piano you could feel she's really have the talent in this music scene. She has the skill, she can do the improvisation well, she jumps her finger in piano with a lot of passion in the whole album. The album itself strengthen my statement. The classical music lover may called it not a pure classic. Mind you, Kokyuu Suru Piano for me is a good mix of nice rendition of some idol songs and classical pieces. Makes it a good material as a gateway to introduce classical music to the youngster this day. On the other side, this album is a new way to get into AKB's music. I love ALL the renditions and the good thing you still could sing along to her rendition. Nice touch. Final word. Kokyuu Suru Piano is a solid album. Idol music and classical pieces maybe impossible to be together but Kokyuu Suru Piano can unite them. One of the best AKB-related releases for 2012 (along with Iwasa Misaki's Mujin Eki and UZA) and I really looking forward to her next release. Rating? I really wanna give it 11/10 but since it's impossible so I give it 10/10.